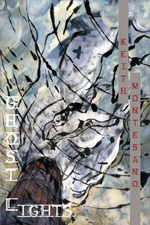 “Who says the hands of the dead don’t ask us / to go there with them?” inquires the speaker in the title poem of Keith Montesano’s first collection. Though, out of context, these lines suggest a portentous summons, Montesano’s poems often nudge, rather than force, the reader to follow the dead. Suicides such as Joe Bolton, an unnamed punk drummer, and Pennsylvania politician Budd Dwyer, as well as murder victims, criminals, and characters afflicted with emotional or mental tumult, take turns in the poet’s elegiac spotlight, but that’s not to say that Montesano plays a Virgilian guide into the afterlife. Rather, he looks at the figures without turning away so that he both paradoxically hardens the reader against the violence and tempers his or her judgment of those involved. The association with violence and, even more so, the function of Montesano’s work recalls Carolyn Forché’s idea that a poem often provides the only account of an experience and, therefore, is evidence of its occurrence. But no poem in Ghost Lights presents a single, decisive piece of evidence. If that were the case, the project of the book would have been averment through reportage. Instead, each poem offers multiple leads, so to speak, dividing the evidence into the tangible (images) and the alleged (account or speculation). we cannot see: the light pale white on half-closed lids. Montesano is a kind of anticubist. His poems contain an authenticity in point of view in that, though the reader receives much of the narrative, it never arrives complete. Montesano never appears omniscient. The poems are then less about the actual circumstance of violence and more about how one reckons with its presence in the world: an individual’s attempt to connect the self to, reconcile the self with, and absolve the self from the violence, but in the process, the questions arise, “Where // did this world” capable of such violence “come from, and how did it appear?” and, does the mere act of inventing “paths toward / the unimaginable” make the unimaginable real? Because many of the poems do not contain an overt first-person “I” but rather gesture toward the “I” in a third- or second-person narrative, the identity of the self, the poet-speaker, remains spectral with the speaker both haunting and haunted by his narratives. “They do not see you there, waiting, leering—,” Montesano writes in “Meditation at Pymatuning Lake,” “watching them until, like the dawn, they vanish again, // fading slowly past the pier, the darkening edges of the lake.” Both the addressee—perhaps the speaker addressing the self in the meditation—and the “they” are illusory and unpredictable and, therefore, ominous. finally fade, and let me have my way with you. In this gesture, Montesano follows two of his influences, Larry Levis and David Wojahn, both of whom develop a narrative momentum that pushes beyond a poem. The self, which outlasts the moment of the poem, faces the exterior world, both what is seen and what is imagined. Montesano pays tribute to Levis and Wojahn not only in the way he deals with the narratives, but also in the titles—the long “elegy” titles, such as “Ostinato: Elegy Beginning on New Year’s Day” or “Two Halves: Elegy for One Summer’s Dawn,” that echo those of Levis’s posthumous collection, Elegy, as well as “Days of 1994,” itself an homage to Cavafy, a nod toward the poem of the same name by Montesano’s former teacher, Wojahn. Whatever evidence accrues from the debris of others’ violence only demonstrates what the imaginative and empathetic poet is capable of, and Montesano’s collection illuminates that which haunts us the most: those specters of ourselves.